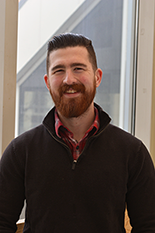 Third-year Mechanical Engineering Ph.D. student Ryan St. Pierre has been named to the Clark School’s Future Faculty program. He is a student in Associate Professor Sarah Bergbreiter’s Maryland Microrobotics Laboratory. St. Pierre focuses on locomotion at sub-gram scales and understanding the forces and dynamics involved in building more efficient and effective small-scale robots. He applied to the Future Faculty Program because he wanted to expand his skills beyond the laboratory. His ultimate goal is to continue on in research, academically or otherwise, and he believes this program will provide additional training that will allow him to become a more well-rounded researcher. The Clark School Future Faculty program aims to shape the future generations of professors within the engineering field. Program members take three one-credit training seminars, a teaching practicum and a research mentoring practicum. The three main objectives are to increase the number of qualified future teachers that will graduate from the Clark School, prepare selected doctoral students to achieve career-long success in the academic world as both teachers and researchers, and to place selected students in leading institutions and continue to partner with the University of Maryland. --Thanks to the Mechanical Engineering Dept. for this story!